KAMPALA – The Judicial Service Commission has shortlisted eight justices including six Lady Justices for the position of Deputy Chief Justice as the search for Steven Kavuma’s replacement gets into high gear. Justice Kavuma is due to retire in September when he turns 70, the retirement age. Kavuma, whose tenure has been mired with controversies, especially in some infamous rulings, is alleged to have previously tried to ‘revise’ downwards his age to gain more time in office. The Deputy Chief Justice hit rock bottom earlier this year when he issued an interim order stopping a parliamentary probe into the so-called ‘presidential handshake’ in which some 42 public officials shared Shs6 billion of taxpayers’ money. But Speaker of Parliament Rebecca Kadaga had responded to Justice Kavuma with an iron fist, slamming down his interim court order for interfering in the oversight powers of the House. “This is unacceptable. I want to direct the Attorney General to go to court and ensure that this stupid order is vacated,” Speaker Kadaga had said. With Justice Kavuma’s attempt to cling on swatted, his retirement is inevitable and come September, Uganda will get a new Deputy Chief Justice. The Judicial Service Commission has been active in interviewing the prospective candidates, shortlisting eight top justices for the position. In the shortlist, the six Lady Justices are Solomy Balungi Bossa, the Justice of the Court of Appeal who was part of the Bench that annulled the Anti-homosexuality Act, 2014; Hellen Abulu Obura, Justice of the Court of Appeal; Esther Mayambala Kisaakye, the Justice of the Supreme Court, the highest court in the land; and Stella Arach Amoko, also Justice of the Supreme Court. Others are Justice Lillian Tibatemwa-Ekirikubinza, of the Supreme Court, who infamously wrote the lead judgment against the re-appointment of Benjamin Odoki to the Chief Justice post. Justice Odoki had clocked 70, the retirement age, though President Museveni had handed him a two-year contract, which Odoki accepted. Inspector General of Government Irene Mulyagonga Kakooza completes the list of the Lady Justices vying of the Deputy Chief Justice post along with two men;Justice Alfonse Owiny-Dollo, of the Court of Appeal, and Justice Fredrick Egonda-Ntende, also of the Court of Appeal. 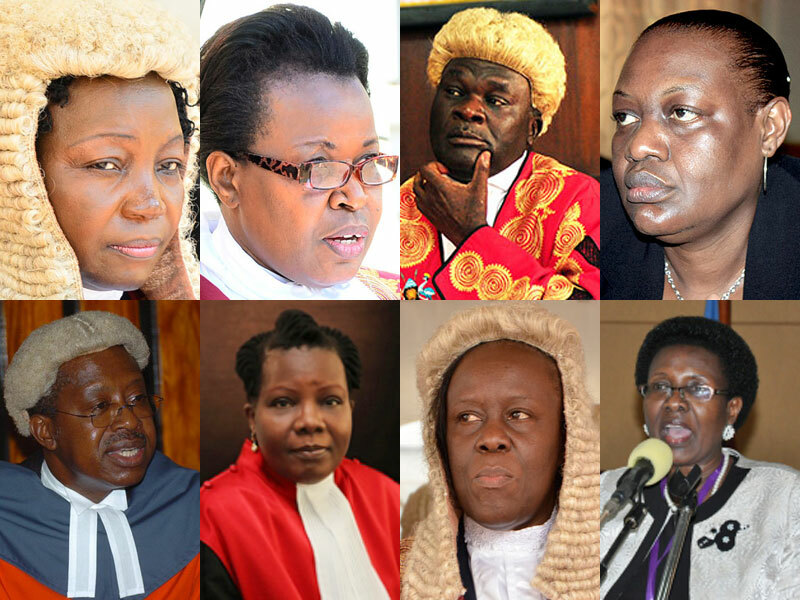 PML Daily brings you the mini-profiles of the eight justice in line to replace Steven Kavuma.